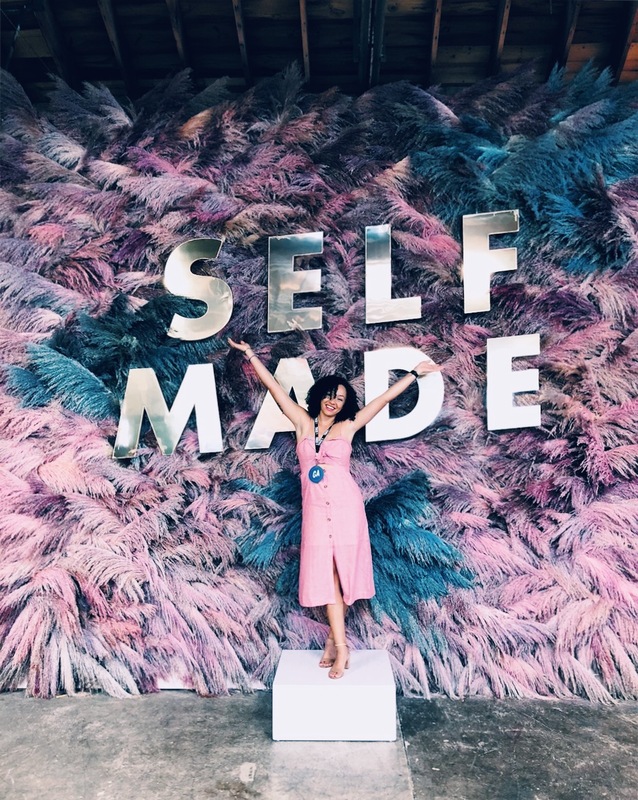 Create & Cultivate Chicago conference was a bustling hub of CEO, founders, side hustlers, and girl bosses making their dreams a reality. I purposefully wrote down “attend a business conference” in the business section of my vision board and jotted down Chicago as a destination I dreamed of traveling too. So as you can imagine when I saw the Create & Cultivate Chicago conference I knew these dreams were manifesting themselves right then and there. So I booked my flight, purchased my ticket, and prepped for what was going to be the trip of a lifetime. I had track one, the entrepreneur track, which focused on building a successful brand and how to find success in your career. Each keynote speaker and panel discussion got me thinking - how can I create a business I truly love. I was shaken to my core by the incredible women that were speaking on their struggles, their wins, and their journey. The event kicked off with a happy hour celebration at WeWork’s Chicago location. At this event, I met two new business besties and fellow social media gals, Crystal and Brianna. I also mixed and mingled with other boss babes attending the event from all over the nation representing different industries. The next morning, we headed over the House of Vans which was decked out in Create & Cultivate branded decor. There were goodies and treats galore from the incredible partnered brands for the events. The day consisted of chats, networking time, and tons of Instagramable photo-opts. As I’m writing up this blog on the plane ride back to Tampa, I am reminiscing back on one of the most memorable weekends in my life and one of the most exciting moments in my career. The conference left me with two overstuffed goodie bags and new friends that I will never forget, but Create & Cultivate Chicago truly made its impact on my journey as a female entrepreneur. From the notes and ah-ha moments I had this weekend, I’m here to share the major things I took away from my first conference. The power of investing in your business and outsourcing. One common theme from all the women that spoke at Create & Cultivate Chicago was one thing - the power of investing in your business. One of the speakers put it simply by saying “Sometimes you have to spend money, to make money”. These wildly successful women had their teams and outsourcing to thank for propelling their business to the next level. Often outsourcing is the most difficult decision businesses have to make in regards to what to take off their plate and this rang true with my early struggles as a business owner. After this conference, I am now ready to invest my money into growing my team and staying away from the struggle that is “but I can do everything myself”. The journey to success is never easy and always imperfect. These incredibly successful women all were vulnerable when it came to sharing the journey that got them to where they currently were in their careers. And let me tell you, success did not come easily to any of these women. The roads were often bumpy, crowded with doubt, and failures were the norm. It was that they kept going and powering through those struggles that led to the height of their careers. In the Negotiation panel, this point left me shook for a lack of a better term. Often the hardest part at the beginning of any service-based business is knowing your worth. Pricing is a foreign world when it comes to considering hours spent and knowing your worth. As I’ve become more sure worth when it comes to clients, this panel was the reassurance I needed to know when to say no and when to stand firm on what I’m worth. Passion builds a successful brand. The passion from not only the speakers but also the attendees was contagious. I left Create & Cultivate Chicago eager to work in my business, chat with my clients, and plan even bigger goals for Sol Studio. Jenni from Jenni’s Ice Cream was a perfect example of this. She loves her ice cream - tasting it. Researching the science behind it, asking her customers about it, you name it. Even after her business has grown, her love for creating delicious ice cream was apparent and shows in her success. This caused me to always remember what sets my heart on fire and to always go back to my why. Living creatively looks different to everyone. This was one of my favorite observations from the conference. From networking at the event, I loved hearing everyone’s story. Whether they were just starting their business, in the grind stages of their side hustle, or growing in a career with a company they loved, it was the perfect example that living a creative life should look different from everyone. You don’t need to grow a business to find happiness, you can pursue that side hustle you love just because you love it, you can change career paths and pursue an industry that really sets your heart of fire. Community over competition rang true throughout the entire conference. Each woman attending the conference or speaking at Create & Cultivate Chicago believed in encouraging, supporting, and empowering one another. I was able to meet women in various industries including social media gals like myself. This element of community played a major role in shaping the connections I was able to make with not only the attendees but also the guest speakers. To get ready and book my next conference. Create & Cultivate Chicago left me inspired and energized to get back to working in my business. I left with more clarity on my goals for the rest of the and the accomplishments I wanted to strive for moving forward for Sol Studio. If you're hesitant to attend an event like Create & Cultivate Chicago, I say do it. As someone who is a bundle of nerves from any networking event, this even truly helped transform me as a businesswoman and a person. Tune in to the IGTV Vlog for a behind the scenes look at the Create & Cultivate Chicago conference!